The 3rd edition of this highly successful text builds on the achievement of the first two editions to provide comprehensive coverage of IMS. It continues to explore the concepts, architecture, protocols and functionalities of IMS while providing a wealth of new and updated information. It is written in a manner that allows readers to choose the level of knowledge and understanding they need to gain about the IMS. 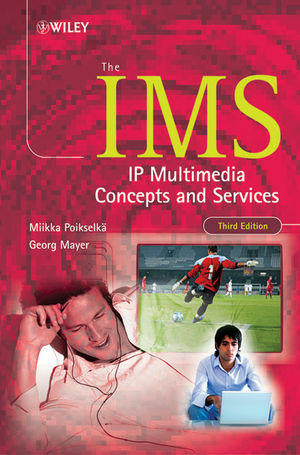 With 35% new material, The IMS,IP Multimedia Concepts and Services, 3rd Edition has been completely revised to include updated chapters as well as totally new chapters on IMS multimedia telephony and IMS voice call continuity. Additional new material includes IMS transit, IMS local numbering, emergency sessions, identification of communication services in IMS, new authentication model for fixed access, NAT traversal and globally routable user agents URI. Detailed descriptions of protocol behaviour are provided on a level that can be used for implementation and testing. Miikka Poikselkä works for Nokia Siemens Networks, Finland. Georg Mayer works for Nokia Mobile Phones, Finland. All the authors are involved with Third Generation Partnership Project Agreement (3GPP), Internet Engineering Task Force (IETF) and Open Mobile Alliance (OMA) standardization. PART I IMS ARCHITECTURE AND CONCEPTS. 1.1 What is the Internet Protocol Multimedia Subsystem (IMS)? 1.2 Fixed and Mobile Convergence. 1.3 Example of IMS Services. 1.4 Where did it come from? 1.5 Why a SIP Solution Based on 3GPP Standards? 2 IP Multimedia Subsystem Architecture. 2.2 Description of IMS-related Entities and Functionalities. 3.3 Mechanism to Register Multiple User Identities at a Go. 3.6 IP Multimedia Services Identity Module (ISIM). 3.7 Sharing a Single User Identity between Multiple Devices. 3.8 Discovering the IMS Entry Point. 3.10 Mechanism for Controlling Bearer Traffic. 3.14 Connectivity between Traditional CS Users and IMS Users. 3.16 Support for Local Dialling Plans. 3.19 Combination of CS and IMS Services – Combinational Services. 3.21 Security Services in the IMS. 3.22 Interworking between IPv4 and IPv6 in the IMS. 4.1 Who will use the Presence Service? 4.3 Presence Contributing to Business. 4.5 Presence Service in IMS. 5.1 Group Management’s Contribution to Business. 5.2 What is Group Management? 5.3 What is XML Configuration Access Protocol? 5.4 What is Common Policy? 5.6 XCAP Usage for Resource Lists. 5.7 Open Mobile Alliance Solution for Group Management. 5.8 Multimedia Telephony and Service Management. 6 Push to Talk Over Cellular. 7.1 Overview of IMS Messaging. 7.5 Instant Messaging by Open Mobile Alliance. 8.1 IMS Conferencing Architecture and Principles. 10 Introduction to Detailed Procedures. 11 An Example of IMS Registration. 11.2 Initial Parameters and IMS Management Object. 11.3 Signalling PDP Context Establishment. 11.5 SIP Registration and Registration Routing Aspects. 11.7 Access Security – IPsec SAs. 11.8 SIP Security Mechanism Agreement. 11.9 IMS Communication Service Identification and other Callee Capabilities. 11.11 Access and Location Information. 11.12 Charging-Related Information During Registration. 12 An Example IMS Multimedia Telephony Session. 12.2 Caller and Callee Identities. 12.7 Charging-Related Procedures During Session Establishment for Sessions. 12.8 Release of a Session. 12.9 Alternative IMS Session Establishment Procedures. 12.12 A Short Introduction to GPRS. 13 An example IMS Voice Call Continuity Procedures. 13.2 Configuring the Clients with Communication Continuity Configuration Parameters. 13.3 Setting up the Initial Call and Call Anchoring. 13.4 Domain Transfer: CS to IMS. 13.5 Theresa adds Video to the Call. 13.6 Domain Transfer: IMS to CS.